1817 was a very important year for gold coins. 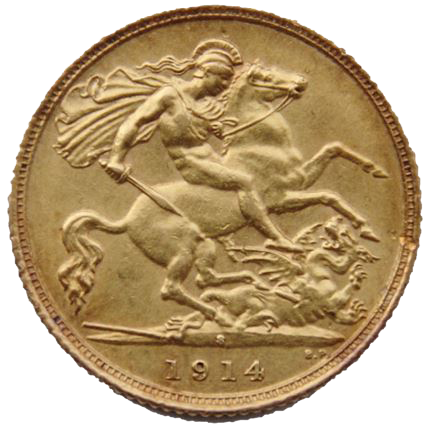 Two hundred years ago, the modern sovereign was introduced and featured an original depiction of St George and the Dragon by the renowned Italian sculptor Benedetto Pistrucci. The design quickly became a much-loved favourite and has been used more or less continuously to this day. Now, I have to confess a small numismatic heresy. I’ve never really warmed to Benedetto’s famous design. Of course, I can admire the astonishingly intricate detail and recognize it as a sublime work of art by a master craftsman at the very top of his game. But I’ve never been able to get past the fact that the patron saint of England is charging into battle on a horse that is clearly too small for him. Mind you, even riding a small pony into battle looks like overkill given the diminutive size of George’s opponent. According to the famous legend, the terrifying fire breathing creature was about to eat a young maiden when the brave knight arrived to do battle with the beast. However, Benedetto’s dragon is the same size as a cocker spaniel and looks about as deadly. The artist depicts the poor animal lying on its back about to be trampled to death by the flailing hooves of George’s unfortunate pony. Seven years after Benedetto’s design first graced the gold sovereign, the RSPCA was established. Personally, I think everyone concerned had a lucky escape. Of course, none of this stopped me from purchasing my own copy of the iconic design when it appeared on a silver £20 coin in 2013. I even bought several to give to family members at Christmas. Regardless of the shortcomings of my own artistic appreciation, the most popular and enduring design ever to appear on British coins is an undisputed masterpiece and its beautiful craftsmanship deserves our enduring respect. 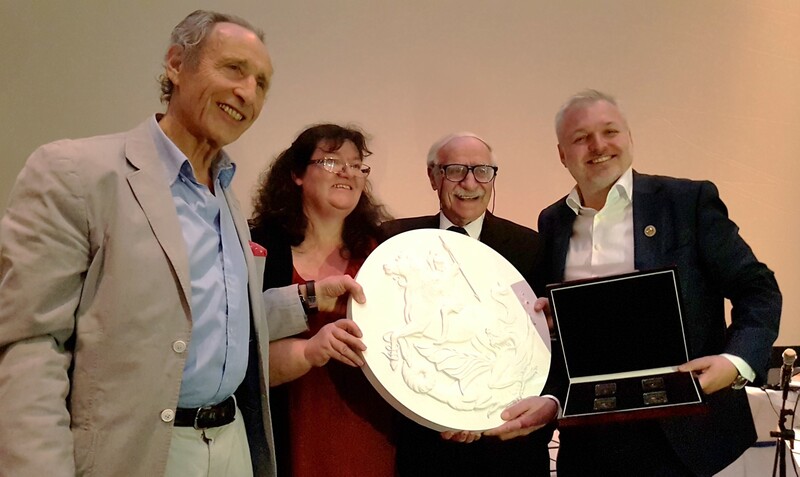 To commemorate the bicentennial of the most famous fight scene in numismatic history, The London Mint Office has done something rather clever. They tracked down a descendent of the fiery Italian and discovered that she was an accomplished artist and sculptor in her own right. 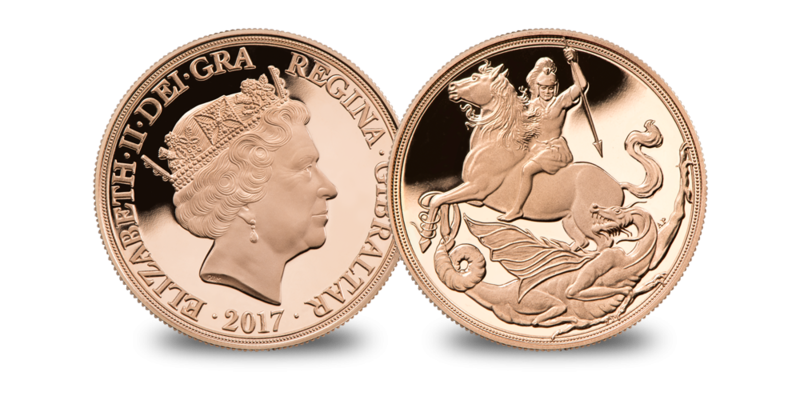 Unable to believe their good fortune, they invited Canadian artist Angela Pistrucci to create an entirely new interpretation of her great-great-great-great uncle’s famous design for the 2017 Gibraltar sovereign. The result was officially unveiled to great acclaim at the 46th World Money Fair in Berlin earlier this year. I’m pleased to report that Angela’s design depicts a real battle of equals locked in titanic struggle to the death. George’s horse is now rearing up in nostril-flared terror as one of its hooves is snared by the Dragon’s twisting tail. The mythological creature now resembles a giant nightmarish winged crocodile with a mouth full of razor sharp teeth, and looks perfectly capable of devouring a multitude of young maidens without breaking into a sweat. Meanwhile, our hero is captured in the act of plunging a spear downwards towards his snarling adversary. However, the outcome is far from certain. Will George’s spear find its target? Will the Dragon succeed in toppling the horse and bring George tumbling to the ground? If ever a coin needed a sequel this is it.